How To Get There: Plane via José Martí International Airport. Soundtrack: Buena Vista Social Club, Gloria Estefan, Pitbull. Best For: Going back in time. Experiencing history. Tips: Cash only, no ATMs, little wifi and cell phone reception. Tax on converting USD (bring Euros or Canadian dollars to avoid extra fee). Most places don't have websites. Some restaurants are government-sponsored. Good to Know: Get Visa and Cuba-ready stamp before you depart US. Two major national brands of beer: Presidente & Bucanero. Attire: Linen, Panama hat, colorful sandals. I made it as close as Ybor City, Florida (aka Little Havana) in early 2016 on Cuban soil in Jose Martí park (yet was so far!). I researched ways to get there via Mexico and other countries but was risky and expensive. So when U.S. airlines started service there in late 2016, the dream became more of a reality. At the same time, I knew it was going to get touristy quickly. Yet, after months of research, I realized it was going to be a challenge to find the kind of hyper-local Cuban experience I craved (i.e. meeting with Cubans, talking with them, hearing their stories, and immersing myself 100%). Not only because it’s nearly impossible to find information or book arrangements online beforehand, but also because it’s even more difficult to communicate with people and businesses once you arrive (given there is little phone or internet service). Plus, you can’t just go on vacation or wander around because technically you can’t get a Visa without a legitimate purpose (and being a tourist isn’t one of them). UPDATE (June 2016): Trump announced his administration is stepping up requirements including verifying a full-time schedule of activities that “enhance contact with the Cuban people, support civil society in Cuba, or promote the Cuban people’s independence from Cuban authorities, and that the travel must result in a meaningful interaction between the traveler.” In addition, Travelers to Cuba will have to keep detailed records of all their financial transactions in the country for five years to make available to the Treasury Department if requested. El Camino Travel is a DC-based travel company that curates unique experiences in Latin American destinations. I’ve been following them for as long as I’ve been in DC and I even reached out to them to ask if they’d add Havana as a destination (apparently I wasn’t the only one!). Their trips are intimate, exclusive and include everything from dinner reservations at up and coming restaurants to activities off the beaten path. In addition to supporting economies in less developed countries through tourism, they also give a portion of the trip proceeds back to a person or organization who is championing their craft in that particular area. Plus, they send an experienced photographer with you so you can be fully in the moment and “be a traveler, not a tourist” (their motto). It was more than perfect. …I rolled out of bed and rushed to my computer to learn more, only to find out the 2 trips for February and March were already SOLD OUT (in hours). I sadly stalked their website in remorse, admiring the itinerary and dreaming of what would have been the trip of a lifetime. When low and behold as I was browsing, they released a “secret” trip for April without any email or social media announcement. I told my good friend the news (who was interested in going too) and by the end of the day, her and husband had booked their spots AND flights – and without hesitation, Matt and I did too. Especially given the new president who I had a feeling was going to make it more difficult to travel there in the near future. (And to think we woke up that morning with no intention of this all happening). The next day, El Camino sent us a welcome email with a selection of Cuban reading, movies and podcasts to educate ourselves (and get us excited about the trip). The next week we had a Google Hangout to ask questions and meet the team and a couple weeks before we left they sent us a welcome packet with all the details (including an itinerary, names and Instagram handles of the other travelers, packing list, phone #’s, key phrases and things to know complete with a playlist to listen towhile reading it and to get pumped up while packing). We even had goodies in our Casa when we arrived filled with a handwritten card, rum, a cigar and salsa CD in a recycled bag made by a local artist. No detail went unnoticed and they truly went above and beyond in making the experience perfect and flawless. Almost every US-based airline now flies there (even discount carriers like Southwest and Spirit) so it’s easier and more affordable than ever to get to Cuba. However, at the moment, only a handful of cities are direct (NYC, Miami, Ft. Lauderdale and Charlotte). We went from DCA via MIA to and CLT from Havana on American Airlines. Our flights changed several times before departing (I’m sure due to it being a new destination/route for nearly a dozen carriers all fighting for limited gate and air space). While the base fare is pretty cheap (as they are encouraging travel to Cuba), there’s an additional fee on top of that for exit fees included in your ticket. But overall, still pretty decent ($250 pp RT). NOTE: You can NOT check in online ahead of time (either direction) and there is TSA pre-check leaving the United States but NOT leaving Cuba. (Although we did notice some of VIP line in Jose Marti airport). For American Airlines, you have to pay for a checked bag (even if you have an AAdvantage card like we do and it’s normally free). But everyone got two free checked bags coming back, regardless of AA card or not (to load up on souvenirs). And if you pay for an additional checked bag coming home, you must pay in cash (more on that later). They also recommend getting to the airport 3 hours ahead of your flight, which we did but in hindsight wasn’t necessary (better safe than sorry, even though it meant getting to DCA at 4am for a 7am flight). As of when we booked in late 2016, you need a Visa, and to get a Visa, you’ll need to qualify for one of the 12 reasons to apply for one*. The Cuban government welcomes Americans (and their money) and to them, we are bonafide “Tourists.” However, to the U.S. Government, we are anything but that and they’re pretty rigid in their requirements. We went for “people to people” but there are other less popular reasons too (journalism, education, etc). *UPDATE June 2017: The requirements could change given the White House Announcement. Once you qualify, there are three ways to get your Visa. 3) Go to the Cuban Embassy. Since we live in Washington DC, just down the street from the Cuban Embassy, I thought that it would be a fun way to get our Visas. Well, we learned the hard way that it’s the exact opposite and let’s just say that it’s a last resort. Getting it online is more pricey ($50 for Visa + $30 processing per person) but at least gives you peace of mind to have it ahead of time. Getting it at the airport is only $50 but you’ll probably need to get to the airport even earlier than the 3 hours they recommend. Either online or at the airport, you need to show your flight confirmation and give the reason of travel. Whereas the Cuban Embassy required a professional photo and an exact address of your stay (not to mention limited hours and the lack of English, PLUS a week turn around, so yes multiple trips there). Plus sunglasses, your Cuban hat to block the sun (or better yet get one there) comfy shoes or sandals and breezy dresses/lightweight clothing. TIP: before you go, download both Google Translate and Google Maps to your phone for offline which come in VERY handy to communicate and navigate sans internet. They’ll stamp your passport (but it’s important to keep your Visa because they’ll take it once you leave). Then, you’ll go through a security check (similar to TSA but much easier) give a health form to a nurse (which you fill out on the flight saying you haven’t coughed or sneezed in the past 30 days) and give your customs form as you exit the terminal. First thing upon exiting terminal is exchange your cash to CUC (produced “Cooks”). Note: there are NO ATMs in Cuba (and they don’t accept credit cards or non-Cuban currency anywhere). So plan accordingly and bring more cash than you think you’ll need. There is a 3% exchange rate + 10% TAX “F-U America” for USD. Some tourists go through the trouble of bringing Pesos, Canadian Dollars or Euros to avoid the VAT, but by the time you exchange it ahead of time (for around 3%) then figure out the US exchange rate, you’re better off just paying the fee (and don’t have to worry about exchanging the unused cash back to USD afterward). There were 2 places outside the terminal where you can convert and since everyone has to get CUC, there’s a long wait (and they only let one person at a time, even families, and couples). If you need more CUC’s there are apparently places to convert inside the city (hotels) but expect to pay a slightly higher fee. We had a driver pick us up but taxis are the other way to get into town. It’s mostly yellow taxis at the airport (similar to the ones you’d see in any other major city) but once you’re in Old Havana there are mostly classic cars to get around. Either way, make sure you are getting a licensed cab that says “Taxi” (and negotiate the price before you get in the car). Our driver the majority of our time in Cuba was “Pitbull”. He hardly spoke English new all the lyrics to every American 90’s pop song and sang them loud (and proud) and even pulled over on the highway a few times to breakdance to Backstreet boys. But don’t worry, he safely got us around and did so with Cuban charisma (if only Uber drivers were as entertaining). He was quite the character and chauffeur. Casas particulars are the main place people stay as they’re more affordable than hotels (which are super hard to find availability and much more expensive). 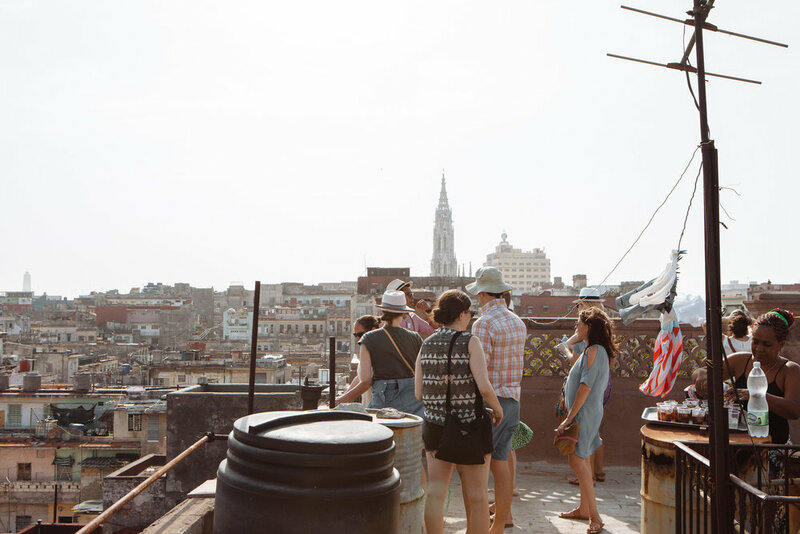 And they’re a better way to get to experience the Cuban culture. We loved our casa particular because it was more like a Bed and Breakfast than a person’s home with homemade breakfast, linen service (fresh towels and beds made each day) mini fridge stocked with beer, wine and soda and toiletries. The owners were very sweet and we only saw them in the morning when they served breakfast and when we checked out. They’re very affordable ($15-30 per night on average) but El Camino took care of accommodations for us (one of the many perks). In my research on Airbnb I found this place, but it’s booked solid for the foreseeable future. Keep in mind that you might not be able to pay in advance (just in cash once you check-in). And for those who are not accustomed to hotels, there are no chains to cash in on those reward points; only a few larger, historic hotels which you can’t book online. Both the Hotel Presidente and Hotel National are centrally located so if you do stay in a Casa you can still visit both and use some of their amenities (hotel bar, wifi in the lobby, gift shop) if you get homesick. We visited both for a drink and to check out their beautiful architecture (see photos below). From the time we stepped foot into Cuba until we landed back in the US the entire 5-day El Camino experience was like a dream. We had an itinerary, but there were so many unexpected surprises along the way (in a good way). Each moment was like turning a page in the chapter to a new adventure. That was probably my favorite part: not knowing, not being in control, and not having to worry about logistics – just fully enjoying the moment (especially for a type-A planner like me). My expectations were high but they were exceeded beyond belief. Since El Camino arranged most of our activities and meals (including scouting, reserving and paying) I can’t speak to specifics of how to execute these experiences (some of which you can’t because they were at private homes or exclusive). Which goes back to my original reason we went to Cuba with El Camino: to have that burden lifted and experience Cuba as a traveler not a tourist. If you’re looking to go to Cuba, I’d recommend using a similar company (and luckily for you I’ve written an extensive review of the various Cuban Travel Services – from full-service packages to a la cart tours and even cruises which are a fun way to see multiple parts of the island). UPDATE June 2017: According to new rules you must use a travel company and can’t go on your own so more reason to use a third-party service! Without further adieu, our trip recap! It was speechless, but I will try my best to summarize along with photos (mostly by the talented Lauren Colton) AND video (at the very end). After a long day of travel, we dropped our bags at our casa, met our hosts and (most of) new travel buddies and walked a few blocks to have lunch on the Malecón, a seawall and popular hangout spot for locals that stretches along the northern coast of Cuba. We had a few free hours to ourselves after lunch, but the group was excited to bond and explore so I suggested we check out the Hotel National, a historic art deco building that dates back to the 1930’s. It sits up on a hill in the center of Havana and overlooks the water – and it turned out to be the perfect place to have a welcome drink on the lawn (complete with peacocks) and get to know our travel mates. Turns out, it’s also home to the guns that made up the Santa Clara Battery is a World Heritage Site – and, most interestingly, it is next to the bunker where the missiles where placed as part of the Cuban Missile Crisis. Famous guests of the hotel include Frank Sinatra, Winston Churchill, and Ava Gardner to name a few (including Obama’s staff during his trip). After that, we headed back to the Casa to get ready for our private Welcome Rooftop Reception. We were dropped off and escorted up three flights of stairs to enjoy mojitos, live music and dancing while the sunset behind us in the backdrop among the old buildings. There was a cigar bar half way up (pictured above) so of course, we had to partake in a little puffing while soaking in the sounds and beautiful views. After the warm welcome, we had a Dinner in a Local’s Home (Somos Cuba). One oven, two burners, 20 hungry people and a solo chef whipping up a family-style lobster dinner. The walls were adorned with memorabilia, and flags from various places were hanging around the room that couldn’t have been cozier. Every morning we woke up to the sunlight pouring in the windows, a view of the sea and adjacent rooftops, and a delicious homemade breakfast spread of fresh made juices, sliced passion fruits, huevos, queso and pan. We kicked off our first full-day with a Convertible Tour of the City with stops at an artist studio, parks, and a fort – all with photo ops along the way. It was the warmest day of the trip, but luckily we got to soak in the sun with a cool breeze in our hair. I must admit, I felt like we were movie stars at many points throughout our 5-hour journey through the city. Highly recommend classic convertibles as a means of transportation and a way to get a 360-degree view of all parts of the city. And since we had an entourage, we could try out different cars and pretend like we were a parade: passing, honking and waving at each other (which never got old). Our first stop (after a brief photo opp in a park) was at an artist’s studio where we got to meet and chat with Victor about his work. Paint is very hard to come by and he has friends outside of the country that send it to him. Then we drove through a national park nestled in the middle of town that had the most breathtaking views along the water with morning light pouring through the treetops. We learned a little more about the Santeria religion since they do sacrificial ceremonies on the water there. A quick drive by some historic monuments including Plaza de la Revolución) and a pit stop at El Morro Castle (a fortress just outside the main part of the city) for some more photos and a roadside mojito from a cart. At one point, one of the cars broke down but with a couple tweaks under the hood, they caught up with us 10 minutes later (it was apparent that if you own a car in Cuba, you must also be a mechanic – yes even the ladies are too). Our convertibles dropped us off in Old Havana for lunch at El Del Frente, a public restaurant (less common) and probably my favorite meal of the entire trip. They brought out tons of tapas for the table as appetizers, I had lobster tacos and we all savored on frozen drinks, that more refreshing after a long morning in the sunshine. After lunch, we went straight back to sightseeing. This time on foot and a walking tour of Old Havana with our guide Orlando who took us to a few private homes and his collaborative artist studio, all right off the street. By late-afternoon, we were getting a bit sweaty, tired and ready to head home and relax before dinner. But did a quick stroll through an old market then a finale at a rooftop home to partake in some traditional drumming and dancing with locals and Cuba Libres (coke and rum) that gave us a second wind of energy! That night we ate at Fábrica de Arte Cubano, a popular nightclub/restaurant/cultural center in town that I read about on almost every article and blog about Havana. It’s like an IKEA maze of art, music, food and drinks. There was a line to get in (even before they were open), but since we had dinner reservations we didn’t have to wait and walked right in. We could have stayed there all night but were exhausted from a full day and had an early morning day trip the next day. But we got a taste of the art, food, music and drinks (with your bar tab stamped on a passport-type card) before heading back to the casas to rest up. Ate a quick breakfast and hit the road to Viñales, a rural town about 2.5 hours west of Havana, lined with colonial-style wooden houses and tobacco farms (and surprisingly touristy given how remote it is). Our caravan stopped about 2 hours into the roadtrip at a little open-air, road-side market with waterfront cafe, piña coladas and wifi (though I kept my commitment to myself and didn’t indulge…in the wifi that is, couldn’t resist a fresh colada with sugar cane in the countryside!). We passed through the village of Viñales and ended up at a family farm for our very own private Pig Roast in the Countryside. Trailers of tobacco leafs passing by with a lake on one side of us and a jungle on the other. I didn’t eat the meat, but devoured the side dishes of yucca, plantain chips, fresh sliced vegetables and fruits, and, of course, Cuban rice and beans. It was quite the authentic experience. Post-lunch, we went up the street for an Ox Cart Ride through an old Tobacco Farm; it was like a Cuban safari with goats, dogs and all sorts of wildlife and nature along the journey. 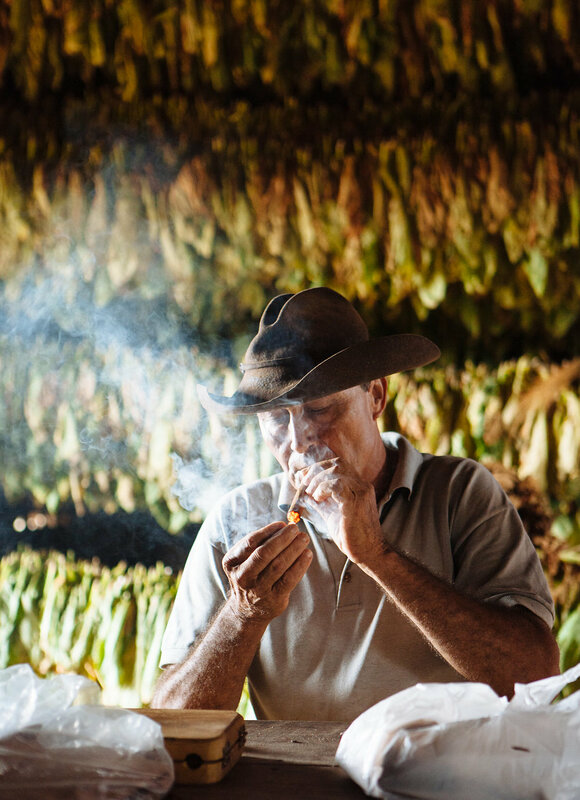 The adventure (albeit wobbly) ended at a hut where a fourth-generation Cuban Cigar farmer shared his secrets of the tobacco growing and rolling process (translated from Spanish), from seed to smoke. The tannery had about five stories of leaves drying out all around us which filled with the room with a musty and delicious aroma. The farmers are required to “give” 90% of their crops to the government (who also own their land) but the 10% they do keep they can “exchange” to those who visit and earn higher profit (so we practically bought his entire supply while helping support the farm!) Pro Tip: dip your cigars in rum or honey (with a star of anise in it) to enhance the flavor, YUM! Afterward, we enjoyed some cervezas on the farm overlooking the hills, drove by the Mural de la Prehistoria (an exposed part of the rock with art painted over the fossils) and enjoyed one last vista before making the trek back to Havana. The itinerary said we would be “meeting a Cuban friend” that morning, but little did we know that “friend” was Ron (Spanish for rum) and it was at La Bodeguita del Medio the infamous watering hole where the Mojito was born (and Hemingway was a regular). Matt and I were dying to find a way to make it there the entire weekend, so the secret was that much more of a pleasant surprise! They even opened the doors just as we walked up (and it was packed solid within seconds). A famous quote from Hemingway is the signature piece above the tiny bar where they make and serve mojitos by the dozens per minute (as a live band serenades you). Outsideand the hole in the wall bar (in the photo above over our shoulder) was an old man who wrote personalized poems on a typewriter as souvenirs (to pay tribute to Hemingway) and we passed a Sharpie around to sign the wall to leave our mark on a piece of history (along with everyone else). In this moment, I can truly say my Cuban experience was now complete – singing and drinking in the streets on a Saturday morning. The perfect prelude to our next stop: Salsa dancing lessons around the corner with instructors from the Cuban Ballet. The afternoon was free, so a few us grabbed a bite in a plaza in Old Havana (after working up an appetite on the dance floor all morning). Having started and ended our day at two of his favorite drinking establishments in Havana, I think we officially checked off the Hemingway box (and picked up one of his books as a souvenir along the way that day). That night we had a goodbye dinner with everyone at Rio Mar, a nice waterfront restaurant, followed by dancing at a nearby castle turned nightclub on the water with live band and our Salsa dancing pros from that morning (the cherry on top to a perfect trip). The Cuban people are SO incredibly hospitable, smart, and energetic (especially given their situation). Time stands still, because there is no mainstream media, constant checking of email, or much access to the outside world. No one is walking around with their head buried in their phone or in a rush and people actually talk to each other and make conversation. The younger generations are very optimistic about the future and progressive in their mindsets. And Cuban kids don’t have video games or TV to watch, so they entertain themselves with marbles or sports outside on the streets. Cubans that work for the government make $15-20/month (to put things in perspective, that’s equivalent to dinner and drinks for two eating out). There are no raises, no bonuses and no incentives to work hard. But, on the flipside, the government provides free healthcare, free education, food stipends and one year of paid maternity leave (plus 3-months optional paid leave). And since government jobs don’t pay well, many another business on the side to make extra money. When we asked our hosts (one an Engineer and the other a Lawyer) what they wanted to know about the U.S. they yet seemed to already have a sense of our society and life (from Facebook and their friends who now live here). The number one thing they said they didn’t understand was our credit system and how we buy things we don’t actually own. I explained how mortgages work and they looked at us with equal parts shock and confusion because when you “buy a home” it’s not actually yours. Because there are no credit lines or loans in Cuba, people live within their means (and major development projects are done by international investors with connections to resources – ie imports and cash). Guantanamera is the unofficial national anthem and is Spanish for a woman from Guantánamo bay. We heard it several times and there are numerous versions including the most famous one with lyrics from a poet José Martí (whom the Havana airport is named after). There’s basically one kind of water (which is hard to come by because the locals buy it up and re-sell it), only a few types of beer (Cristal in a can, or Bucanero and Presidente in a bottle) and one brand of soda. All owned by the government. 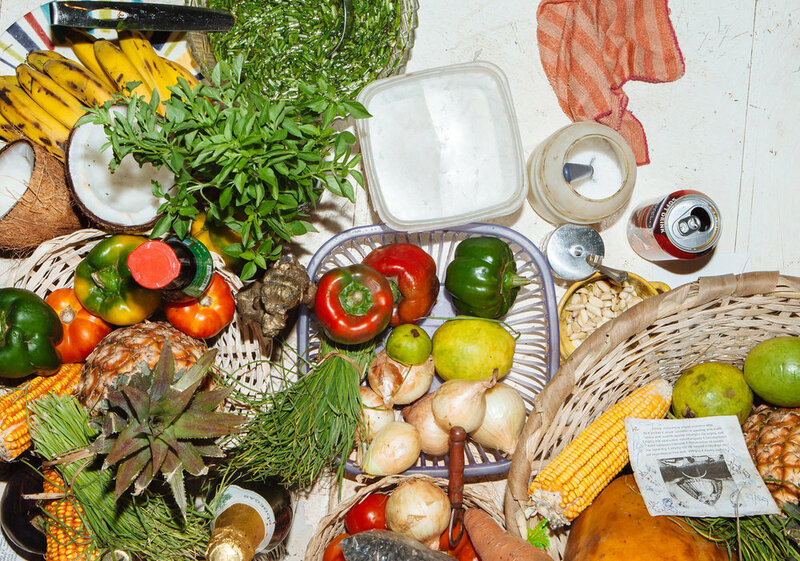 We didn’t make it into a bodega (Cuban grocery market) but supposedly there are not many options chose from (which could be a good thing in my opinion). Toilet paper (and toilet seats) are a rare find in banos (even in nicer restaurants or the airport). And, you were lucky if it also had a working light, lock and flush. However, you’ll never hear a local complaint (and we didn’t either). Wifi cards are available for purchase and use at a few places (hotel lobbies, an airport lounge) but it’s not very fast/reliable and I would recommend taking full advantage of going back in time, being off the grid, not checking email and not feeling the need to post/share on social media (until after you get back). When it comes to buildings, don’t judge a book by its cover. The outside might be a bit rundown, but more than likely, it’s nicer inside. The government doesn’t provide guidelines or enforce rules for exteriors (i.e. no HOA or Neighborhood Associations) so there’s not reason to put effort (or money) into the facade. (Although when Obama came to town, they paved the streets and painted the buildings of the roads along his motorcade route – nicknaming him a “diplomat”). This trip changed me in ways I still can’t comprehend. I smiled so much it hurts. I laughed so much I cried. I had so many “pinch me moments” that forever impacted my life. I will forever cherish the memories, the friendships made with Team Cuba, the bonding with our local hosts, the fact we all were without internet and pop culture and for five days. I never once missed home or our everyday modern luxuries. And since returning back to life in the U.S., I have so much more appreciation for the things we take for granted (and am trying to do my best to infuse some of the Cuban culture and lifestyle into my daily routine). On that note, Matt and I look forward to drinking rum, smoking cigars and salsa dancing with our friends back in the states to share a piece of Cuban with them for years to come. MUCHAS GRACIAS to El Camino and our friends (new and existing) who made this incredible trip absolutely perfect! EPIC is an understatement andI can’t recommend Cuba and El Camino enough. Until next time, hasta luego mi amor and hope this post inspires and informs you as much as it did me.